I have been a little quiet for the last few weeks because I am slaving away in my workshop! You saw the harem pants I tested, and I have also been testing a women’s shirt that I am SO excited to share here as soon as it is released! I also made a cute little hoodie for Lil Fox to wear for Valentine’s Day- but hubby said it was too girly, so it will get sent to one of my nieces. I’m not surprised he drew a line somewhere after the Pink Suit. There are wings embroidered on the back, but I couldn’t get a good picture. Most of my time has otherwise been devoted to making products to list in my soon-to-be-launched Etsy Shop! I can’t tell you how excited I am to be approaching this new adventure. My shop will follow the same theme of this site- vintage-inspired style. I will continue to get my inspiration from classic movies and vintage and modern fashion spreads. The shop will primarily feature accessories, but I will be moving more into apparel through this year. 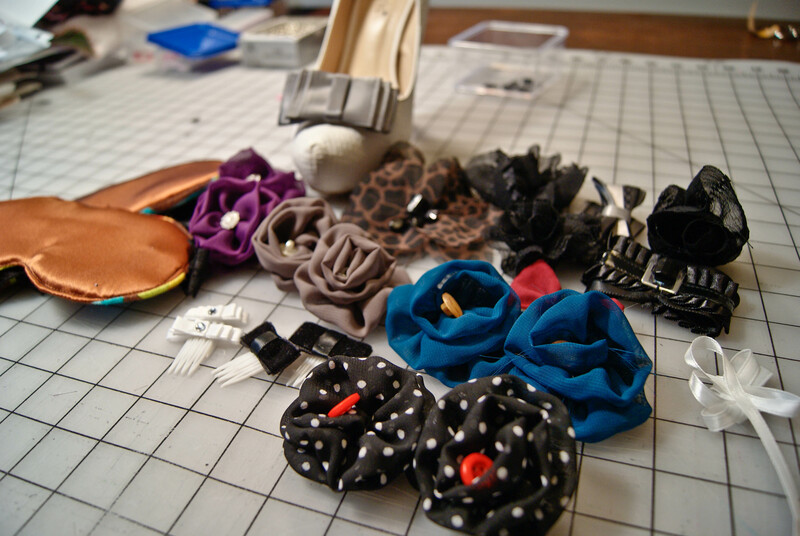 I will be launching with an assortment of hand-crafted aprons, hair accessories, shoe clips, and small bags. My goal is to list new items weekly to keep my offerings fresh and interesting. Keep an eye out for my launch announcement in the next week or so, and in the meantime, here is a sneak peek at what has been keeping me busy. I love to experiment with new fabrics, patterns, and techniques, so finding Swoon Patterns for bags has been a real eye-opener for me. My new life goal is to make every single bag, and I have already purchased the new 2015 subscription that promises to be all vintage-inspired patterns! So please bear with me in the next few months, because you will probably be seeing a LOT of bag experimentation coming out here. 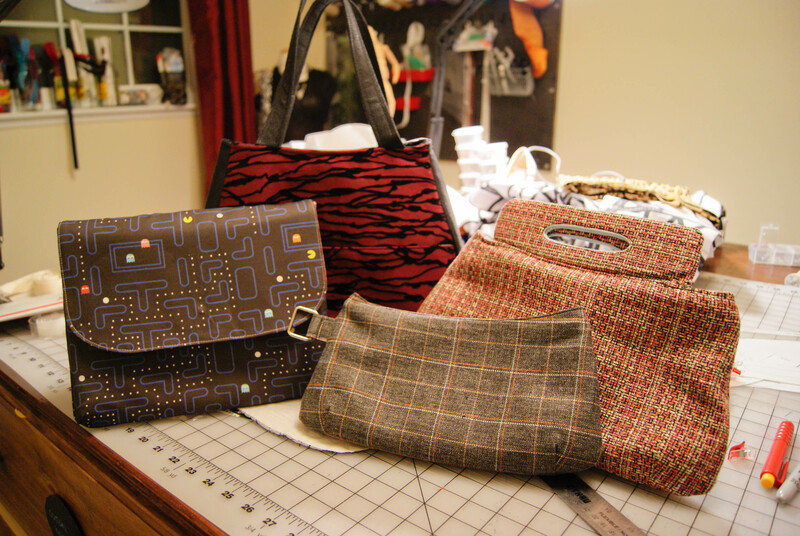 These ones are all practice purses and I’m so thrilled with how well they came out! Aprons! It all started with that damask-print denim and leopard apron I made for the Taylor Swift challenge. 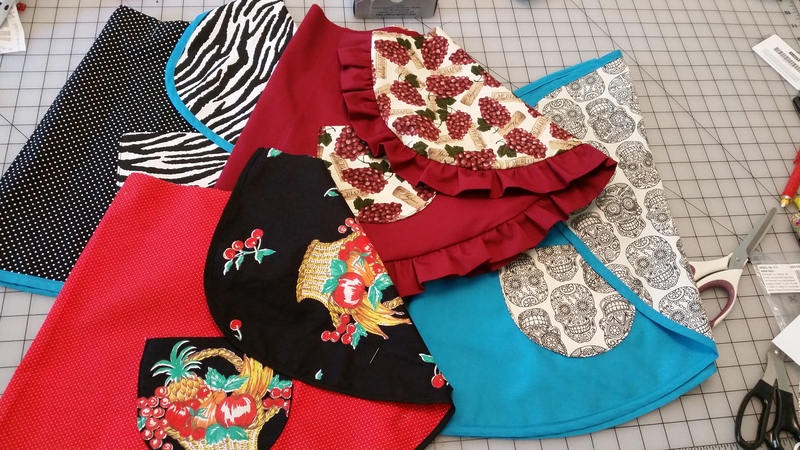 I’ve made four more Betseys, and a couple of utility half aprons as well. I’m working on hammering out my final version of full aprons- one super-ruffly, and one that is more unisex. It’s HARD finding fabrics that would make a good man-apron! If you have any ideas other than camo, let me know. I will also be offering some standard and personalized embroidery, and I’m having fun coming up with alternatives to “Kiss The Cook”. Here are my accessories- and the pile of experimental flowers and bows I made before I finally arrived at some techniques I like. There will be lots more experimentation here, because I love the look of handmade flowers, and want to be sure mine are beautiful, unique, and well-constructed. In time, I want to try making millinery, but that will require a lot more experimentation on my part before I feel comfortable selling. If you like the looks of any of this, please like me on Facebook- there’s a widget in the top right corner of your screen to make that easy. That is where I will be making all of my shop announcements, as well as all of my newer blog posts.